I have the book Training People for a while. 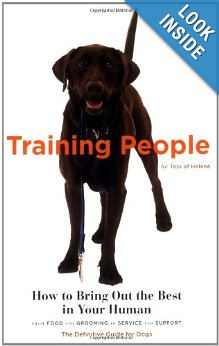 The book is a humorous view from a dog's perspective of training people to be their companions. For centuries, dogs have known that they, not humans, run the show. But not all dogs know how to get the best from their people. Finally, from the leading expert in the field comes a straightforward, easy-to-use manual that's written for dogs by a dog. This indispensable reference provides foolproof advice on obtaining everything a dog deserves, from the best food and exercise to grooming and chauffeur services. Here are all the tools a dog needs for selecting, training, and living with a well-behaved human. Some of our good friends are dog people and what I have noticed lately is how they interact and care for their dog has a close relationship to many other things in life. The funny idea that came to mind that I am going to see if it works is applying the Idea of Training People to reversing the role and having people think about "Training Information." I'll keep on playing with this idea of Training Information and see if it goes anywhere.